A federal judge tossed one of the Obama administration's most controversial regulations into the retirement industry. The Fifth Circuit Court of Appeals ruled 2-1 that the Department of Labor's Fiduciary Rule, which would have given the agency oversight into investment advice given to retirees, represented a usurpation of federal regulatory power. Judge Edith Jones said that the agency engaged in "backdoor regulation" to extend regulatory scrutiny from an employer-based pension system to advisers handling individual retirement accounts (IRAs). The rule would have limited commission-based payment structures for investment advice in favor of fee-based services, which are more popular for large trade accounts. The regulation, the majority said, could harm smaller scale investors by driving up costs for seeking advice. "Although lacking direct regulatory authority over IRA ‘fiduciaries,’ [the Department of Labor] impermissibly bootstrapped what should have been safe harbor criteria into ‘backdoor regulation,’" the ruling said. "It is likely that many financial service providers will exit the market for retirement investors rather than accept the new regulatory regime." Jason Mendro, the Gibson Dunn lawyer who represented the plaintiffs, said vacating the regulation would send a message to government agencies to remain within the bounds of legislation. He said the ruling came down to the separation of powers between the executive and congressional authorities and praised the court for its "meticulous decision and analysis." The majority "not only puts an end to a bad rule; it also advances the cause of liberty by confirming that administrative agencies cannot arrogate more power to themselves by compelling the regulated public to agree to that arrogation," Mendro said in a statement. 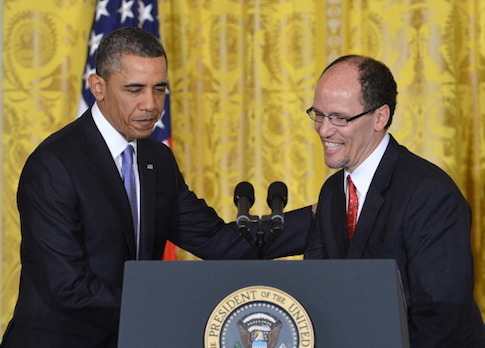 The Fiduciary Rule was one of the signature policies of DNC chairman Tom Perez during his tenure as labor secretary. He called it an "historic" regulation in an outgoing message to regulators. The ruling won praise from lawmakers who had criticized the department for stepping between investment advisers and those with retirement accounts. Sen. Johnny Isakson (R., Ga.) introduced legislation to reverse the fiduciary rule when it was initially proposed by the Obama administration. He said Congress needs to clarify the law to avoid future "bureaucratic overreach." "I'm thankful that the court has recognized that the ‘fiduciary rule' represents a massive bureaucratic overreach and is a solution in search of a problem," Isakson said in a statement. "I’m committed to the repeal of this big-government regulation that harms hardworking Americans who need access to quality advice for their retirement planning." The rule was scheduled to take effect on January 1, but the Labor Department announced in November it would delay implementation to July 2019. A Department of Justice spokesman says the agency is reviewing whether or not to appeal to ruling. This entry was posted in Issues and tagged Obama Administration, Supreme Court, Tom Perez. Bookmark the permalink.